I am so excited to be participating in the New Year New Skill CAL! Today I am going to chat a little bit about broomstick lace and test your skills with a simple little pouch pattern that I designed. I have a few different tutorials for you to look at that are great for beginners or for someone more experienced that may just need to brush up on their skills. Broomstick lace can seem intimidating but I assure you, a little practice and you can make something absolutely gorgeous! Broomstick lace is beautiful stitch pattern that is made with crochet stitch but utilizes a large dowel or knitting needle to make an open lace. Broomstick lace is worked by pulling loops through crochet stitches, adding them to the knitting needle, pulling the loops off into groups of 5, and securing them with 5 single crochet stitches. There are many variations on how to work the broomstick lace so you have to find what works for you and what feels comfortable and more natural. I, personally, hold my knitting needle between my knees while others lay their knitting needle on a flat surface. I have included a few different tutorials below to help you find a method that works best for you. To begin a broomstick lace project, you will need a large knitting needle. I purchased an inexpensive plastic US 50 (25mm) knitting needle from Amazon. I prefer the plastic only because it helps slide the stitches off easier. 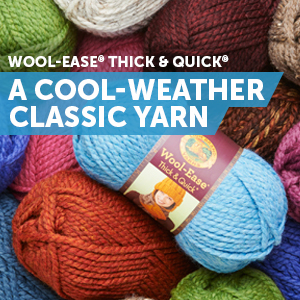 You will also need a yarn and a crochet hook that goes with your yarn. For my example, I used Red Heart Boutique Unforgettable with a size H 5mm hook. I like the Red Heart Boutique Unforgettable yarn because even though it is labeled a category 4 yarn, it is thin and the colorways are all gorgeous. For a beginner, I recommend using a medium weight yarn (category 4) to start with since it is a little sturdier than a finer weight yarn. Broomstick lace would work with any yarn though but it’s better to practice with something a little sturdier so you don’t have to worry if you have to rip anything out. I have utilized a few different tutorials to help learn the art of broomstick lace. There are some videos and some photo tutorials, which are both great resources. If you have taken a look at the tutorials above and think you are ready to tackle a pattern, here is the pattern for my Broomstick Lace Pouch. It is just 8 rows of broomstick lace, which shouldn’t be too bad! I hope you give it a try! This project is worked flat and then seamed to form a pouch. Bring the two ends of pouch together so that the first row meets Row 18. Using yarn needle and yarn tail, whip stitch the sides of the pouch together. For a more finished look, attach your yarn to the side of Row 18 and sc evenly around the entire top flap and around the opening of the pouch. Position the button inline with the button hole created in row 25. Sew the button on using yarn and yarn or darning needle. As an optional step, you can add an inner fabric lining to your pouch since it is a little open. I am not using mine for small items so I did not add a liner. Oooohhh! This will go very nicely with the Broomstick lace scarf I will be making. Thank you for this pattern!